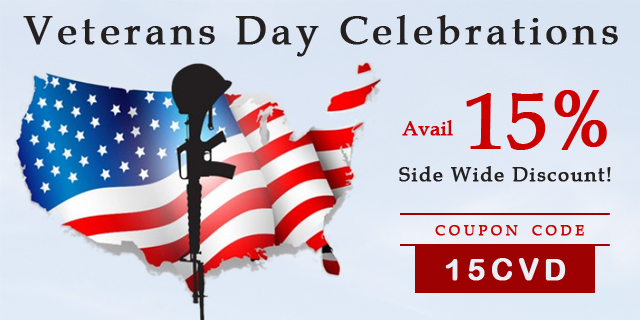 Join Canada Vet Express in Veterans Day Celebrations- Avail 15% Site Wide Discount! Since 1938, November 11 is celebrated as Veterans Day to honor all the veterans who served our country. Canada Vet Express has decided to celebrate this big day by offering 15% site wide discount and would like all the pet parents to join in our celebrations. Canada Vet Express has been with the pet owners of USA for almost more than a year now. We have received great support and trust from the customers which have ultimately made us one of the most opted online pet supplies store. We are highly preferred for our authentic products available at affordable rates. On your visit at CanadaVetExpress you may find an extensive range of pet care products for dogs, cats, birds, and pet health. We are categorized into various sections naming flea & tick control, heartworm treatment, wormers, joint care and arthritis treatments. Canada Vet Express provides free shipping all over the country irrespective of where you live or the price of the order. With Veterans Day sale on, you have a perfect opportunity to try out new products at much lesser price. You can also avail unmatchable vitamin and nutritional treatments at discounts which you may be usually ignoring because of its cost. In all, this Veterans Day is your golden chance to stock on pet supplies for dogs, cats and birds. Visit our online store, save big bucks and have a great shopping experience! Use coupon code: 15CVD while checking out.